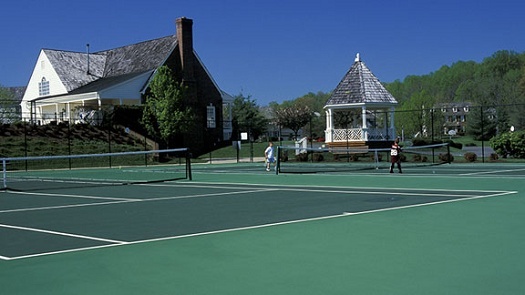 Woodlea's tennis courts are private and reserved exclusively for use by residents, members, and their guests. - Play is available on a first come, first served basis unless reservations have been made on the reservation sheets posted at the courts. - Each resident or member may use the courts for a maximum of 2 hours at a time. - Monday – Friday from 5 PM until dusk children (ages 16 and under) may only play with an adult member or when no adult members are waiting to use the courts. - One player must display proof of residency or membership by using the clips attached to the fence. The ID must remain on display during play time. - Court #1 is closest to the gazebo. Court #2 is furthest from the gazebo. - Tennis courts are to be used for tennis only. All other activities are prohibited on the courts. - Pets are not permitted on the tennis courts at any time. - Report any damage to the court surface, net, gate, fence or gazebo to TWC.